1.Place oven rack 4 to 5 inches from broiler. Preheat broiler to high. Lightly brush both sides of salmon with oil. In 13 x 9-inch baking dish, place salmon, skin side up, and broil 3 to 4 minutes or until skin is lightly browned. 2.With wide spatula, turn salmon. Pour lemon juice over salmon and sprinkle with pepper, garlic powder and salt. Broil salmon 6 minutes. Evenly sprinkle rosemary and red onion over top of salmon; broil 2 to 3 minutes or until salmon is almost opaque throughout and internal temperature reaches 145°. Slip spatula between salmon skin and flesh to remove skin. 3.Serve salmon garnished with rosemary sprigs and lemon slices, if desired. 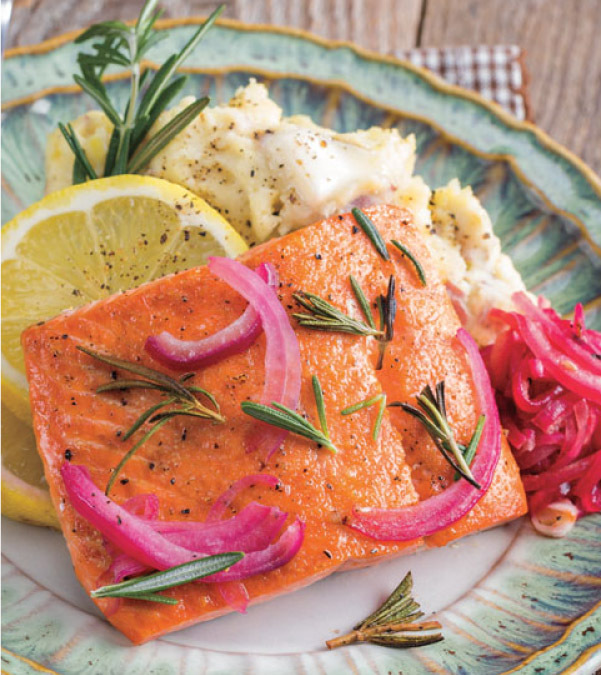 > Pair this salmon with steamed new potatoes for a simple, healthy and delicious meal.